Please note that the content of this book primarily consists of articles available from Wikipedia or other free sources online. 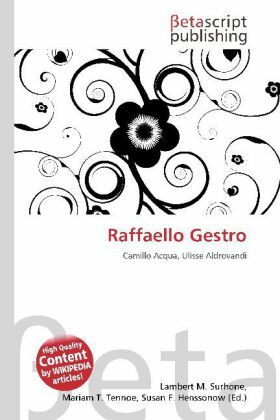 Raffaello (or Raphael ) Gestro (21 March 1845 , Genoa - 6 June 1936 , Genoa ) was an Italian entomologist who specialised in Coleoptera Gestro was the Director of the Natural History Museum of Giacomo Doria Genoa where his collection is conserved. He was a Member and President of the Italian Entomological Society. Expedition Insects Indicating the amount and origin of insects collected for Genoa Natural History Museum from 1874-1895 1874, 1876. Enumerazione dei Cetonidi raccolti nell'' Archipelago Malese e nella Papuasia dai signori G. Doria O. Beccari e L. M. D''Albertis e A. A. Bruyn. Annali del Museo Civico di Storia Naturale di Genova 6: 487-535,8: 512-524, 9: 83-100. 1878. Contribuzione allo studio dei Cetonidi della regione Austro-Malese.Annali del Museo Civico di Storia Naturale di Genova 12: 26-31.